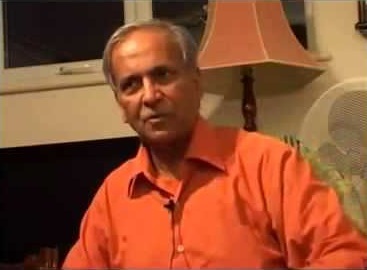 Dilip Lakhani is a well-known figure in the British Hindu community. He is founder of Vivekananda Centre UK and for many years has been on a seemingly tireless mission to promote Hinduism in Britain. His work has included setting up GCSE and A-Level Hinduism classes, delivering talks at hundreds of schools, colleges and universities, working with education and media institutions, holding yoga and meditation camps and interfaith work. What moved you to take up this work? My work in teaching began as a result of not being able to find a comprehensive Hindu education for my daughter. By comprehensive I mean that it should teach Hinduism as a whole, not just the point of view of one sect of Hinduism. I couldn’t find anything that offered this, so I decided to start up something myself. There were only three students initially. But we stuck at it and gradually it picked up, although the process was very slow. Before you took up these activities full-time, what was your occupation? I studied Physics up to Master’s level. After this my father got very ill, so I managed the family business between the ages of 21 and 42. When I had enough money I switched away from it, scaled down my lifestyle and began my Hindu work. I moved here in 1964, from Tanzania, so for over forty years now. How has Britain changed since you’ve been here? There are many things. One thing is that the Hindu community has swelled considerably and is much more established. What age did you really get into Hinduism? An important turning point in my life was reading the ‘Complete Works of Swami Vivekananda’, when I was aged 17. I re-read it many times over a three-year period. Even before that I had always reading smaller Hindu books, since the age of about 7. I was always drawn to stories of spiritual personalities of ancient and modern India – especially Vivekananda, Ramakrishna, Ramatirth and Ramdas. These are very dynamic people who were talking about spirituality from direct experience – not theory. This is what was really intriguing. I think it is important to be exposed to Hindu teachings from a young age. Even if it’s just stories, it creates a fertile field for deeper thinking. What are the main contributions that Hinduism can make to the modern world? There are four important things. The reconciliation of science and religion, teaching of experiential religion rather than mere theories, promotion of pluralism in religion, and the idea of the essential divinity of humanity. Could you expand on your point about science? One of the places where Hinduism will make a very big contribution in the modern age is reconciling the scientific approach to knowledge with religious truth and experience. This may seem far-fetched, but philosophies like Sankhya, the oldest philosophy within Hinduism have shown tremendous similarity to Quantum Mechanics, and can actually further their concepts and help make sense of it. Conceptually there is no making sense of Quantum Mechanics without Hinduism. The West is used to a fatal opposition between science and religion, but this separation is alien to the Hindu worldview. You often deliver talks to non-Hindu audiences. What is the response when speaking to such crowds? There is a mixed response, but it is mostly positive. People are hearing sophisticated ideas they have never heard before. Generally the younger audiences are open to new ideas but older people see me as a threat, as if I’m trying to convert them, which is not at all the case. Many Religious Education teachers who have an anti-Hindu slant to their teachings are hostile to me. What are the major challenges for Hindus in this country? Most of us do not have a grasp of our amazing spiritual heritage. Many Hindus are very confused and uncomfortable with the way that Hinduism is portrayed to them, for example in the media and education system. We need to remedy this. Do you ever encounter hostility or opposition to your work? Fortunately there haven’t been serious verbal or physical threats. There is a lot of hostility from certain sections of the educational establishment, who have tried to block me out or discredit me behind my back. There is also a lot of apathy from the Hindu community, which can be quite discouraging. The life story of Swami Vivekananda. Anything I’ve been through is minor compared to the kind of discomfort and hostility he faced. He came penniless to the West at a time when racism and religious exclusivism were common, and was subjected to a campaign of vilification. Also I couldn’t get by without the support of my family. My wife has helped tremendously at every step of the way. What spiritual practices do you personally engage in? Hinduism teaches every person has God in them. I try to put the teachings into practice in my interacting with mankind, trying to see God in everyone. My most important worship is the work I do. What are your favourite pass-times when you are not engaged in religious work? What are your views on caste? In authoritative Hindu scriptures there is no hereditary caste system – all it says is that we should use our personal gift or aptitude for the benefit of society. Hereditary hierarchical caste system does not affect most Hindus yet it is presented in schools as the defining feature of Hinduism. It is just a deviation from the real teachings of Hinduism. The so-called castes that we see are clans or social units. Within them people can choose their own career. In the UK the only place where the hereditary caste system is practiced is Buckingham palace.